It can be hard to find places that will be great for everyone (babies, toddlers and parents simultaneously) and this list has been tried and true for being fun for everyone! This blog posts talks about 4 places that are fun, family friendly and enjoyable for all ages. This means the kids will have a blast, and you as a parent will fill engaged and fulfilled as well. 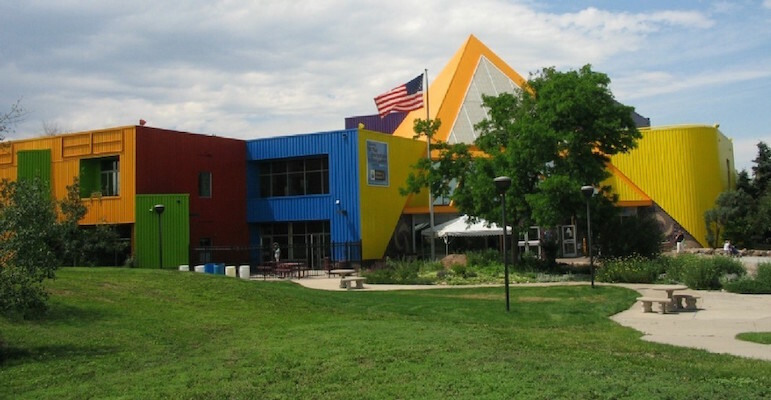 The Children’s Museum of Denver is an energetic, exciting place for children of all ages. Hit a Starbucks on your way over because you will need some fuel to keep up with all of the fun! The museum is separated by age appropriate play. Downstairs has a learning experience and play area for young babies and children and upstairs has an area designed for older children, though children all of ages will be happy anywhere in the museum! Fine motors will be explored with art, making paper rockets, playing veterinarian, creating bubbles in a bubble room/laboratory. Gross motors will be developed through hands-on play and interaction with climbing structures, navigating a pretend grocery store, and dancing in their dance party club. The museum is very energetic so it is best that sensory sensitive children go to the museum with a supportive caregiver or go on days exclusively designed for sensory sensitive children. The cafeteria has limited seating and food options, so be prepared to bring your own lunch and eat outside on the picnic tables next to the playground. Though the museum is stroller friendly, you may find it too crowded to easily push a stroller around, so leaving it downstairs will probably serve everyone best. The Denver Museum of Nature and Science (DMNS) is a museum located in Denver. It is a great place for patrons of all ages. The museum offers exhibits that offer educational and learning opportunities. Many exhibits feature animals, astronomy and dinosaurs, and so much more. They have an area called “Discovery Zone” that is specifically designed for very young children that has art tables, puppet shows and fine motor skill development. The DMNS is a great place to take babies and toddlers because there is ample parking, it is stroller friendly, has fantastic food, and has something for everyone. Many of the exhibits feature animals so any animal lover will love it! It is refreshing to find a place that is educational for many ages at the same time. Even on busy days, the upstairs exhibits do not feel cramped and crowded, which is great for sensory sensitive people and children. There is plenty of private space to nurse or feed your baby. There are lots of restrooms as well! It is a lovely place, specifically for toddlers and babies because the exhibits are fun for everyone of all ages, even for the parents! The Denver Botanic Gardens at Chatfield is satellite location of the Denver Botanic Gardens. It is on several acres in southwest Denver (near Chatfield, Ken Caryl, Littleton). With ample parking and an honor pay system, it is one of the best deals for your money and with little children because you only pay per vehicle rather than per person. The Botanic Gardens feature manicured and unmanicured gardens and fields. It is great for toddlers who need to walk and get energy out, so I recommend leaving that stroller in the car! There are plenty of picnic tables for your bagged lunch. There is also a play structure, but it is pretty unnecessary because of all the natural fun exploring flowers, trees, dirt and bunnies if you see them! There is also a rooster than occasionally crows, so you will be in luck if you hear him! The mature trees offer shade and ambiance for the hot summer days. There is a restroom with flushing toilets by the parking area. It is usually very quiet and never crowded, which is great for a relaxing experience where you can enjoy the nature and children being children. If you a ready for a drive to Morrison, get gas in your car and start heading out! Tiny Town is an adorable outdoor experience that has little playhouses along a trail. The little playhouses are big enough for children to walk inside and touch, yet tiny and small enough to be adorable and charming. The mature trees that surround the walk make it nice and cool for a summer day. There are picnic tables at the end of the walk where you can eat your lunch. There is a small gift shop on your way out as well. And for all train lovers, hop aboard the train ride that goes through a small but enjoyable loop around Tiny Town. Have a location that you LOVE and want to add to our list? Email us at info@doualsofdenver.com! We look forward to hearing from you!